Spray 12-inch skillet with cooking spray; heat over medium-high heat. Cook beef in skillet about 5 minutes, turning once, until brown. Sprinkle with salt, Italian seasoning and garlic; remove from skillet. Place beef, seasoned side up, in 4-to 5-quart slow cooker. Spread tomatoes and olives over roast. Add broth and onions. Cover and cook on low heat setting 5 to 6 hours or until beef is tender. Remove beef from slow cooker; cover and let stand 15 minutes. Slice beef; serve with beef juice and onions from slow cooker. Note: This recipe was tested in slow cookers with heating elements in the side and bottom of the cooker, not in cookers that stand only on a heated base. For slow cookers with just a heated base, follow the manufacturer’s directions for layering ingredients and choosing a temperature. Kalamata olives have a dark purple color and a rich and fruity flavor. They are generally packed in olive oil or vinegar and are sold whole or pitted. 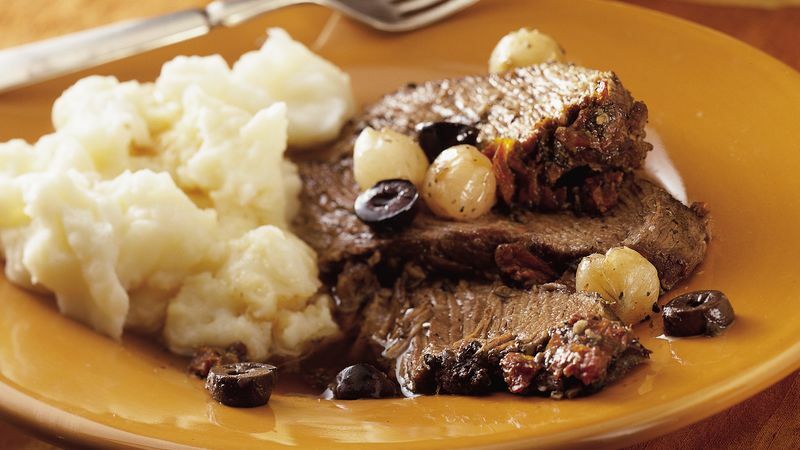 Fluffy homemade mashed potatoes--skins on or off--is the perfect partner for beef roast.